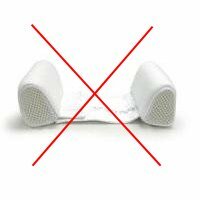 A baby sleep positioner or baby wedge forms a potentially fatal risk so do not use any, ever. The CPSC and FDA warn that babies have died after getting stuck between the wedges and the crib side. Let's find out why that is + learn how to keep baby on her back without a dangerous holder in the crib. Along with all other crib safety and SIDS guidelines, we should always put baby on her back to sleep: it's the single safe baby sleeping position. Since parents have been advised to keep baby on the back at the end of the 1980's, SIDS rates have decreased a lot (!). And it still the standard recommended way to sleep. But, it's never a good idea to try and keep your baby on the back with a sleep positioner. You probably have seen these rolls or baby wedges in different shapes and sizes. Our mothers and grandmothers used them (or a rolled-up towel) to keep us sleeping on the side (which was sometimes still recommended in those days). You can still buy them or even find them included with a so-called in-bed mini cosleeper which I no longer recommend. 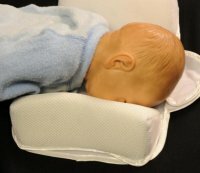 We want to make sure parents, health care professionals, and childcare providers understand the potential risk of suffocation and stop using infant sleep positioners." So there is no way we can take this risk. Still you do want to find a way to keep your baby safely on her back. What if baby rolls over onto her tummy while asleep? First of all, when baby is put to sleep on her back in an empty crib (as recommended) and then rolls over, the risk of suffocating is lower than with a baby sleep positioner in the crib. Exactly because there is no extra material to get stuck in. SIDS prevention guidelines advise for you to be near your baby (supervise closely, ideally sleep in the same room) to monitor carefully. In particular in the first year, with baby in her own crib or cosleeping safely. This way you're there to monitor your baby and can roll her over when necessary. So putting down on the back in an empty crib is crucial. During transition times (when learning to roll over), a well-adapted, right-size, right-temperature (all of these super important for safety!!!) baby sleeping bag (also called wearable blanket) helps some to keep baby on her back, safely. That is because it makes rolling over just a little bit more difficult. Once your baby rolls back and forth easily, you will still want to put her on the back to sleep whenever you place her in the crib. Some parents stay near and resolve to keep turning them around. Most experts agree though that this isn't necessary (see external links below). But once your baby is so agile and strong to roll back and forth easily, and you are confident that she will also be able to do it while asleep, the risk from being on her tummy decreases, as this comment by Dr Sears and the answer to the rolling over question on Safe to Sleep state.